Yesterdays Close: March corn futures closed down 2 cents, trading in a range of 3 ¼ cents on the day. Funds were estimated sellers of 5,000 contracts on the session. Fundamentals: Export sales this morning came in at a dismal 101,200 metric tons, this compares with the expected range form 600,000-900,000 metric tons and last week’s 1,245,500 metric tons. Yesterday’s weekly EIA inventory data showed that ethanol production was down from 1.090 million barrels a day to 1.032 million barrels per day. Ethanol has been a silver lining for the corn market, the overall trend has been stronger so this week’s read is more of an outlier, if weakness becomes a new trend then we will have some issues. Market participants are continuing to watch weather and developments in South America, there is nothing new to report on that front this morning. Next week’s USDA report is arguably the most important fundamental catalyst on the horizon as we will get a good deal of updates. We will start compiling estimates and have them in next week’s reports. Technicals: We saw a lot of folks get excited about corn earlier in the week while we were waving the caution flag suggesting you trade the market you have not the one you want. The market failed at the 50-day moving average which will continue to be first resistance, we have not seen a conviction close above this technical since July; this comes in at 354 ½ today. We continue to believe a nickel on either side of 350 represents opportunity, until we get a fundamental catalyst to give us a breakout or a breakdown. Volatility has been extremely light which gives a tremendous opportunity in the options market. Yesterdays Close: Soybean futures closed 1 ¾ cents lower yesterday, trading in a range of 9 ¾ cents on the day. Funds were estimated sellers of 3,000 contracts on the session. Fundamentals: Export sales this morning came in at 554,000 metric tons, this compares with the expected range from 600,000-900,000 metric tons; last week’s export sales came in at 974,696 metric tons. Soymeal and soy oil are trading higher this morning which are offering support to futures, we will want to see volume confirm price on the floor open. Weather in South America will continue to be important going forward as they round out planting and get into crop development. There are no new updates this morning on that front. Next week’s USDA report will be a major catalyst for setting the tone to start the year, that is on the 12th and we will start providing estimates towards the middle of next week. Technicals: Soybeans have been more or less consolidating between 960-970 after a bloodbath in the back half of December. The bulls still have a lot of work to do on the chart to get in good graces. A close above 971 ¾ opens the door to 985 ½-986 ½. This pocket represents the middle of the 100-day moving average and the 50% retracement from the June lows to the July highs. This will be a significant pocket before and after the USDA report. The chart remains bearish, but for those who want to be long into the report we have been recommending shopping for cheap call options over the week as it gives great exposure with limited risk. Yesterdays Close: Wheat futures closed 1 ½ cents lower yesterday, trading in a range of 5 on the day. Funds were estimated to have been sellers of 2,000 contracts for the session. Fundamentals: Export sales this morning came in at 131,000 metric tons, this compares with the expected range from 225,000-500,000 metric tons and last weeks 487,352 metric tons. 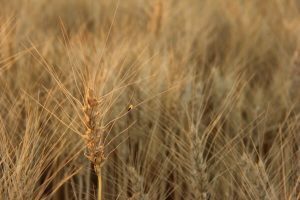 Colder and drier weather has been offering some support, but the damage may not be known until winter wheat comes out of dormancy. Keep in mind that we are also in a seasonally weak time of year. If you had sold March Chicago wheat on January 3rd and bought back on the 16th, you would have been profitable for 12 of the last 15 years with the average gain being nearly 18 cents. Some of that seasonality is likely due to weather premium coming in ahead of time and then going out. Technicals: Wheat futures closed above the 50-day moving average for the first time in a long time earlier in the week, but it is not what we consider a “conviction close” as it more or less lingers right alongside it. If the market can achieve a conviction close above, we could see short covering come into the market to 447 ¼. We still like the bear side of the market but have been more than nimble with our first recommendation in weeks coming in this week to sell from 433-437. We have since reduced and would be looking to step back in on a confirmation of a failure here.